Posted byMei 29 July, 2015 22 June, 2015 Leave a comment on Teledermatology – Was your Remote Eczema Skin Consultation helpful? This is the final post of the 5-part series and today, I will try to apply all that we have learnt in the past 4 posts to eczema skin consultations. I have presented it in survey format for each step of teledermatology and look forward to hearing your experience! 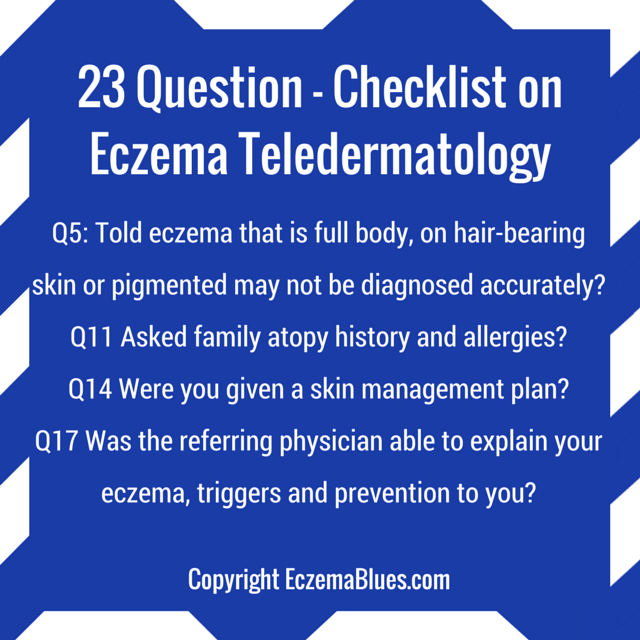 Teledermatology Checklist – Did you Remote Eczema Consultation go well? Q1 Were you given a leaflet to explain teledermatology and what form of teledermatology is available to you? Q2 Were you aware that you do not have to consent to teledermatology? Q3 Were you told that if an in-person consultation is deemed required during the process, you will have access to the dermatologist? Q4 Were you told if it is going to be stored and forward or live videoconferencing? Q5 Were you told that your eczema is suitable or not suitable for teledermatology? For instance, full body eczema, or rashes in scalp, private parts or pigmented rash are difficult to capture fully in images. Or that your eczema is localised and can be clearly identified in image. Q6 Were you told that teledermatology may not be as accurately diagnosed than face-to-face consultation? Q7 Were you told who is the dermatologist and his/her licensure and board certification? Q8 Were you told what images of your eczema will be taken and how these will be stored and protected? Q9 Were you given the instructions on how you can access your own patient record? Q10 Did you feel that the referring physician is comprehensive in recording your medical history? Q11 Were you asked these questions on your eczema? Q12 Did you feel you were treated with dignity during the photography session? Q13 Were you told that you can have a companion during the consultation with the referring physician? Q18 Did you have to wait longer than traditional referral to see the dermatologist who has provided the skin management plan? Q19 Did you have to provide the same information again at the skin specialist clinic? Q20 Did the dermatologist have your information and referral form? Q21 Was the videoconferencing set up in advance and smooth? Q22 Were you told beforehand where you would need to uncover for the skin to be imaged? Q23 Were all the persons in the room identified? In instances where the set up or preparation for teledermatology is inadequate, the dermatologist may only confirm a diagnosis/ provide a treatment plan in-person. As such, it may end up being more time consuming to engage in teledermatolgy. What’s your experience? How many of the 23 questions were ‘checked’ for you?